Does Insurance Cover Roof Replacement? In 2013, there were more than 5,400 major hail storms, according to the National Climatic Data Center. That’s more than five thousand opportunities for hail to cause roof damage. High winds, hail storms, heavy snow and other naturally caused roof damage are an unfortunate risk of homeownership. Luckily, however, insurance will cover roof replacement in many these cases. “Does insurance cover roof replacement” is one of the most common questions our team is asked. Needing a roof replacement can be a stressful process, but knowing that insurance will cover the cost can add some serious comfort to the project. Each homeowner’s insurance policy is different. However, working with insurance companies for more than 20 years has taught us a few things about how the whole process typically works. Does the age of my roof impact if insurance will cover it? The age of your roof is not typically a deciding factor on if your roof damage will be covered. However, it is increasingly an aspect used to determine how much an insurance policy will reimburse you and what repairs will be covered. And, it can impact if the insurance company will cover a full roof replacement or only repairs. For some policies, roofs older than 10 years will received the depreciated value of the roofing as a reimbursement rather than the full cost of a new roof. Additionally, some insurance companies are requiring roof inspects upon policy renewal if a roof is older than 20 years. And, insurance experts anticipate this trend continuing––with additional stipulations being added to policies upon renewal, depending on the roof’s age. How do I know if insurance will cover my roof replacement? Often the quickest way to answer this question is to call your agent directly (some even have text or apps available nowadays). Calling an insurance repair contractor, such as Bloomfield Construction, can help you and your agent better understand the necessary repairs, cost to fix them and process the project will follow. This contractor will be involved in the inspection process to help your agent start the claim process. What is typically covered under my policy? Roof damage caused by most natural disasters is usually included in your homeowner’s policy. Covered natural disasters include fallen trees, hurricanes, tornados, lightning, hail and random fallen debris. Some policies do have a higher deductible for certain types of storm or damage, so consult your agent for more information on this. Also, vandalism and home fire damage to roofing are typically covered. What roof damage is not covered in homeowner’s insurance? Typically, long-term roof leaks are not covered in a generic homeowner’s insurance policy. This is why it’s very important to regularly inspect your roof for damaged, cracked or missing shingles, particularly after a storm occurs. This includes examining the exterior as well as looking in the attic for potential problems. Repairs should be taken care of immediately to increase the likelihood that your policy will cover them. Most policies do not include flood damage; however, interior water damage may be covered if the damage resulted from a roof leak that was caused by a protected situation. For example, if a tree fell on your home, causing interior flooding, your insurance should cover all related damaged. Additionally, regular roofing wear and age are not covered. And, in some cases, this regular wear can decrease the reimbursement amount an insurance will pay following covered damage. Will my insurance rates go up if I file a claim for roof replacement? No. Homeowner’s insurance does not operate in the same way car insurance does, and your rate should not rise if you make a single claim, however you should check with your agent to be sure. 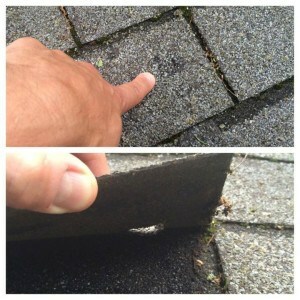 Will my insurance only cover roof repairs or can I get a full replacement? companies want to incur the smallest expense possible. If a simple repair will suffice, that is what will be covered. Also, if the roof’s warranty has expired, this could influence the coverage. Are you working with insurance to cover a roof replacement? Our team may be able to help. We have more than 21 years of experience and several certifications that make us experts in the industry. When should I file a claim for my roof repairs or replacement? As soon as you suspect or identify a problem with your roof! Leaking or otherwise damaged roofing can cause a wide range of problems, some of which may not be covered under insurance if you wait too long. Even if you don’t immediately see a problem as a result of damages on your roof, it’s always a good idea to get an inspection. Contractors have tools that can examine the full extent of the damage, and see things you may have missed. Related Articles: What Does Storm Insurance Cover?